The shadow home secretary said Labour would not pander to the 'immigration panic' and would create a 'humane system' for migrants and refugees. The shadow home secretary Diane Abbott told a packed fringe meeting last night that ‘the whole refugee and asylum process is a bureaucratic mess’ and that a Labour government would create a more ‘humane system’. Abbott promised ‘another world’ and a ‘new order’ for refugees and migrants under a Labour government, where they will be treated in a ‘fair and humane way’ and ‘you do not have mass deportations of the nature that we currently see’. In a speech to conference on Monday, Abbott had said that Labour would end indefinite immigration detention. Last night, the shadow home secretary went further, attacking mass deportations by the Home Office as ‘brutal’. Abbott, who would be ultimately responsible for immigration and policing if a Labour government were elected, described indefinite detention as ‘shocking’ and ‘inhumane’ and that it ‘gets far less attention than it should because in the current toxic debate about immigration’. Over 200 people have been held in immigration detention centres for more than a year, and the UK is the only EU country not to place a statutory time limit on detention, the meeting heard. In September, a BBC Panorama investigation uncovered shocking abuses of detainees and “widespread self harm and suicide attempts” at Brook House detain centre next to Gatwick Airport. Abbott also hit out at mass deportation flights, where the Home Office charters planes to deport people from Britain en masse often, calling them a ‘particularly brutal way of responding of the current immigration panic’. Deportees have compared these flights to “slave ships”, the detainees being restrained often by handcuffs and leg and waist restraints. ‘The earlier speaker spoke about people who had been deported to Nigeria who are not actually Nigerian. Many people are deported to Jamaica who are not actually Jamaican. It’s when they arrive in Jamaica, they find that they are not Jamaican’, Abbott added. But the shadow home secretary also hit out at New Labour, under whom the process of immigration detention was introduced. ‘Myself, Jeremy Corbyn, and others pointed out the lack of transparency and the lack of due process around immigration detention and we were told that we should not concern ourselves’. 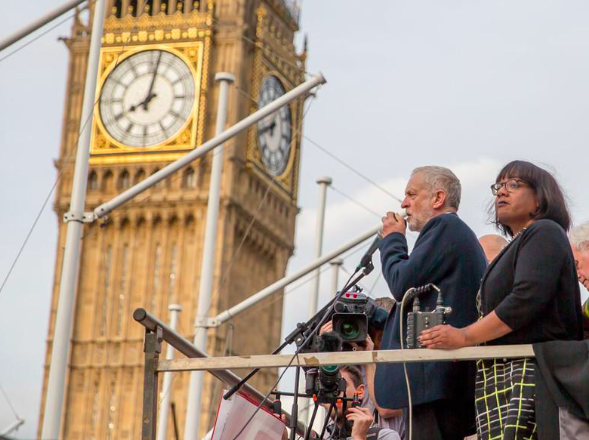 The promise of a ‘new order’ for refugees and migrants in Britain from the shadow home secretary shows Corbyn’s Labour is refusing to play up to, as Abbott has put it, ‘immigration panic’ for political gain. It marks further the shift away from New Labour’s policy’s at this conference. Diane Abbott is promising nothing less than a complete break with Labour history on immigration: every Labour government from the mid-1960s has promised sensible immigration policies but from Harold Wilson (1965) to Tony Blair (1999) Labour has capitulated to anti-immigration agitation and given us increasingly harsh and discriminatory policies. Labour governments have paved the way for what Diane Abbott rightly calls ‘shocking’ and ‘inhumane’ policies. One can only wish Ms Abbott well – she hasn’t got history on her side. But all power to her elbow.